Flowers harvested in the afternoon generally exhibit less leaf blackening that those harvested in the morning. Immediate precooling of flowers works well but only if the cold chain is maintained until retail and/or consumer level. Relatives include Grevillea, Leucodendron, Leucospermum and Banksia. Numerous flowers in cone-shaped heads, 4 inches long, surrounded by stiff colored bracts. Stems with leathery leaves, cut to various lengths. Plant is an evergreen shrub, classed as a dicotyledon. 32-34 F, provide light during storage to prevent leaf blackening. Named after Proteus, a Greek sea god with the power of prophecy. The specific epithet name neriifolia refers to the likeness of the leaves to those of oleander (Nerium). Spectacular focal points in contemporary arrangements, the durable Protea will often bloom for several months. Suitable for drying. Leaves can turn black due to low light and especially due to lack of carbohydrate. Therefore, make sure a fresh flower food containing sugar is used. 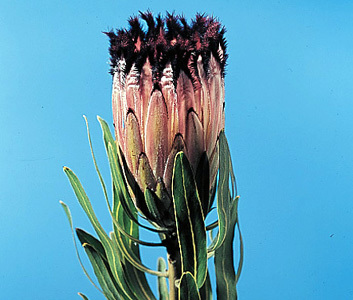 Dai and Paull (1997) noted that Protea neriifolia exhibited much more leaf blackening than Leucospermum spp. ‘Rachel’ due to an unknown inhibitor to this process, also possibly mediated by pH differences.